Commanded the 1st Battalion Worcestershire Regiment from March 1941 to 1942. Commanded the 2nd Battalion Worcestershire Regiment from May 1946 to September 1946. Commanded the 8th Battalion Worcestershire Regiment from August 1945 to March 1946. Lieut.-Colonel Knight was born at Bridgnorth, Shropshire on the 27th August 1897, son of the late Reverend H. E. Knight. He was educated at Hereford Cathedral School, and after going to Sandhurst he was commissioned into The Worcestershire Regiment a few days before his 18th birthday in 1915. After a short period with the 6th (Special Reserve) Battalion, he went out to France and served with the 72nd Machine Gun Company until wounded at Hill 60 in 1917. He returned to France the same year and was wounded again at Passchendale while serving with the 23rd Machine Gun Company. For his services he was mentioned in despatches. He sailed for India with the 11th Machine Gun Battalion in 1919 and was on active service on the North-West Frontier until joining the 1st Battalion Worcestershire Regiment in 1921 and remaining in India until 1926. From 1926 to 1930 he was Adjutant of the 7th Battalion (Territorial Army) at Kidderminster, and in 1929 he married his devoted wife Dorothy. After his tour as TA Adjutant he rejoined the 2nd Battalion in Malta and subsequently served as a Staff Officer to the Straits Settlement Volunteer Forces in what is now Malaysia. Lieut.-Colonel John Oldham Knight, from his initials was universally known as “JOK” Knight. On return to England in 1936 he joined the 1st Battalion and went with them to Palestine. For his services during the Arab Rebellion he was mentioned in despatches. On the outbreak of World War II, Lieut.-Col. Knight was with the 1st Battalion in the Sudan. He served throughout the operations in the Sudan and the Eritrean-Abyssinian Campaign with that Battalion, and took over command of it in April, 1941. He took the 1st Battalion to North Africa and continued in command throughout the operations in the Western Desert, receiving the immediate award of the D.S.O., for operations carried out by the 1st Battalion and other troops under his command in June, 1942. He was taken prisoner at Tobruk in June, 1942. When Italy surrendered in 1943, Lieut.-Col. Knight escaped with a party of officers and other ranks and, after spending some 7 months at large, made his way to Switzerland in 1944. On return to England he commanded the 8th Battalion for a few months. Lieut.-Col. Knight was promoted substantive Lieut.-Colonel in the Regiment in August, 1945. 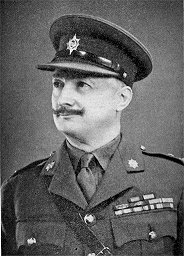 In 1946 he succeeded to the command of the 2nd Battalion in Burma and although the war was over the Battalion had a considerable operational role hunting Dacoits and quite apart from this with large numbers of men impatiently awaiting demobilisation the Battalion was at very full strength and a fairly light touch was required to maintain the necessary discipline and morale. Under these non-too-easy conditions he ran a very successful Battalion until he contracted mepacrine poisoning, which necessitated his being invalided home. Lieut.-Colonel Knight finally retired in May 1948, on account of disability, and shortly after moved to his beautiful home at Symonds Yat where for some years he was engaged in running a local business. Lieut.-Colonel John Oldham Knight, D.S.O., was killed in a road accident on 24th December 1970. At his funeral, which took place at Hereford Crematorium on 1st January 1971, Brigadier H. U. Richards read the Lesson, and Colonel T. J. Bowen, who was one of his Company Commanders at the Battle of Point 187, gave the address. The Regiment was represented at the funeral by Major E. J. Bate, Colonel T. J. Bowen, Lt.-Colonel J. B. Brierley (also re-resenting Mrs. Brierley and Lt.-Colonel and Mrs. R. F. H. Browne), Brigadier and Mrs. P. H. Graves-Morris (also representing Mrs. Senhouse Clarke), Lt.-Colonel and Mrs. A. R. Harrison, Lt.-Colonel and Mrs. L. A. Harrison, Major K. R. H. James, Major H. Knox, Brigadier D. H. Nott (also representing Mrs. Nott), Lt.-Colonel and Mrs. A. H. Nott, Brigadier H. U. Richards, Lt.-Colonel J. D. Ricketts (also representing Mrs. Ricketts, Mrs. Hamilton Cox, and Lt.-Colonel and Mrs. P. W. Hargreaves), Mr. Rogers (Colonel Knight's wartime Batman), Captain T. J. W. Seabrook, Major F. J. Somers, Lt.-Colonel and Mrs. J. W. B. Stuart, Colonel and Mrs. R. E. L. Tuckey, Lt.-Colonel C. P. Vaughan (also representing Mrs. Vaughan, Lt.-Colonel and Mrs. L. G. H. Bryant, Mrs. E. M. Dodd, Lt.-Colonel G. B. de Courcy Ireland, and Mrs. John Dean), Major D. Y. Watson, and Brigadier C. P. G. Wills (representing The Worcestershire Regiments' Association).